Honestly I'm not a huge history fan, while there are bits and pieces of it that I find interesting the majority of it just doesn't interest me, so it's not unusual for me to skip YA novels (or novels of any kind, really) that fall into the category of "historical fiction". The one exception is probably a fantasy novel that has historical pieces of it, but magic (or some paranormal element) is a must, because otherwise I usually just can't do it. So when I heard that Cynthia Hand, Brodi Ashton, and Jodi Meadows were writing a book together set back in the 1500's I was both excited and a little wary. I had read two of Cynthia Hand's novels and had followed all three authors since around the time they published their first novels, so I was pretty familiar with them and how much fun they were, but still, historical fiction. Along with that the book was compared to The Princess Bride, which is a movie I really love, so I decided to give the book a shot. I'm happy I decided to do so. The synopsis was rather vague (as you can see from above) so I honestly wasn't sure what I was going to get out of it, but right away the "narrators" of the book amused me so much I ended up reading about 100 pages. The story itself is mostly told from the points of view of the King, Edward, Lady Jane Grey (of course), and Jane's husband, Gifford. As I said before I really don't know much about history (especially not English history from several centuries ago) but if the REAL Jane Grey was anything like the Jane Grey in the book I think she would have been an amazing person to know (which is probably why the three authors chose to write a book about her). As a whole I was pretty pleased with the book, it was oddly humorous, especially considering it was about a girl who ended up being queen for 9 days before she actually had her head chopped off, but the addition of the magic to the story is what I think helped make that possible. And surprisingly the magic worked really well in the story. Like, I still kind of have to remind myself that the book itself isn't actually what went down, and that all of these characters died MUCH earlier in their lives than what happened in the novel. Jane was my favorite POV to read from (along with our trusty narrators), and even though it felt like the story really didn't start for well over 100 pages I didn't mind all that much because I wanted to keep reading regardless. I also found all of the literary references quite amusing despite the fact that I'm quite sure I didn't catch all of them. The only real problem I had with the book was the fact that things seemed to work out exactly when they needed to. Now granted, I know that that's a rather dumb thing to find a problem with, seeing as it's, you know, fiction, but it was just a little TOO perfect, like, "of COURSE that's when that happened, because otherwise [inset bad thing that would happen here]." But then again like I said it's fiction and of course they had to get around the whole 'all of the main characters should have died at some point during the novel' so I guess I can't find THAT much fault in it. Also, I would have love more involvement from the narrators, but I supposed I can't fault the authors for not adding more of that in either, seeing as the book was about Edward, Jane, and the rest of them, as opposed to the narrators themselves. In the end I was pleasantly surprised with how much I ended up enjoying this book. 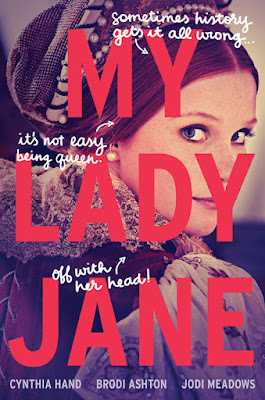 I would 100% recommend fans of the genre to check it out, but I would also just recommend it to people in general, because it's fun, and even though it takes place in the 1500's Jane (and all of the women in the book) are fierce and smart and independent, something that everyone could stand to see more of. Fans of The Princess Bride should also be sure to check it out. I'll for sure be on the lookout for whatever these three authors come up with next, mostly together, but separate as well. So glad you enjoyed this one! I've been wanting to read it for a while now. :) As I do enjoy the occasional Historical Fiction, I will definitely pick up MLJ, given the chance!